the colonization of the deserted territories with hard-working subjects. The uncultivated steppe areas at the Volga River had to be developed. "Fields, which could filling an entire nation could hardly feed a family”. But for a colonization Russia hadn't a sufficient quantity of people because farmers were serfdom and bounded to their lords. So Catherine's hopes turned to Europe. 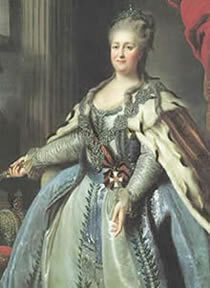 Catherine II was lead by the same mercantilist1 ideas which contribute in Prussia, Austria-Hungary, Denmark and in the British colonies of North America to increase the country. Prussia for example populated areas in West and East Prussia, in the Kurmark, the Neumark and in Pomerania mainly by the establishment of Huguenots2 and exulants of Salzburg3. In 1761 Denmark tried to make Jutland and Schleswig cultivable by settlers. With the "population theory" (more labour force = stronger economy) was expected an economic recovery of the country especially by immigration of foreign workers. 2 Huguenots = members of the protestant reformed church of France (or French calvinists) from the sixteenth to the eighteenth centuries. 3 Exulants of Salzburg = Protestant religious refugees from archdiocese of Salzburg (today situated in Austria). Around 1525 reformation in the archdiocese of Salzburg found many followers who were expelled from the city in 1588. Around 1600 were still living a few Protestants (secret protestants) in the city. In 1729 the archbishop of that time tried to convert the Protestants by Jesuit missionaries, but when they refused, he proceeded with violent measures calling 6.000 Austrian soldiers into the country. In 1731 the persecution of protestants in Europe flared up again and in autumn 1731 all non-Catholics were expelled. East Prussia was since the time of plague (1708/09) a heavily depopulated country. Frederick I, King of Prussia, being Protestant, used the persecution of Protestants in Salzburg to repopulate his territory and on 2 February 1732 he issued an "immigration document". He sent commissioners who had to deal with the transport and the travel of Salzburg's Protestants. The refugees during the trip received daily meal money, 4 Groschen per day for men, 3 for women and 2 for each child. From the day of their emigration request, the refugees had to be respected as Prussian citizens. In several columns the emigrants left Salzburg. They had to abandon their children below 14 years in Salzburg so that they could receive the Catholic faith. They moved to Nuremberg, Leipzig, Berlin, but their aim was East Prussia. On 30 April 1732 the first 843 refugees arrived at their destination. Originally the action was created on about 6,000 refugees, but in the end there was a requestion of 20,000 people. When they arrived in East Prussia, more than half of the refugees received an initial care on State´s costs. To refugees were given land to cultivate, timber to build their houses, livestock, farm implement and seeds. Furthermore they obtained exoneration from taxes for 3 years, generous loans, subsidies for construction costs and a long-term exemption from military service. From that moment Prussia was considered as the protector of all Protestants. In total about 30,000 people left the province of Salzburg, the majority (17,000) found a new home in Prussia. Hundreds of Lutherans from Salzburg found refuge in Georgia (North America) and more than one fifth of displaced people died during exhausted marches.